Yesterday, Classic Elite Web-Letter 188 hit the Internet. Inside it was my newest pattern - the Firefly Foxmoor Scarf! The scarf is knit out of 3 balls of Classic Elite Firefly. That yarn is awesome! You really should try it. When Classic Elite sent me yarn to swatch, I had a few choices, but I was immediately drawn to the Firefly. It's a really great spring yarn. The pattern is a great one if you are new to lace. And, the pattern is both written and charted, so don't let the lace scare you! The pattern is available for free on the Classic Elite website. You can download the pdf here. I had been keeping this one secret for quite a while now, so I am glad I can finally spill it for everyone to enjoy! 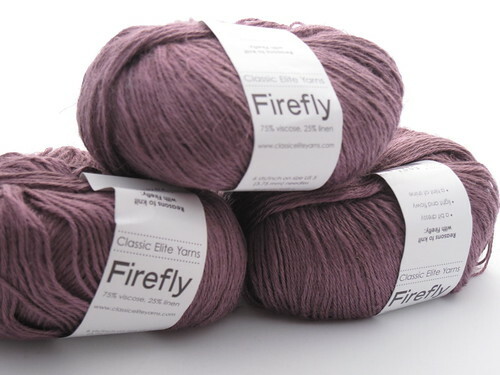 And, to celebrate my pattern in the Web-Letter, I am giving away (yep, you guessed it) 3 balls of Classic Elite Firefly so you can knit your own Firefly Foxmoor Scarf. Just leave a comment between now and Wednesday, May 4th. A random number generator will determine the winner. Please leave your Ravelry name or a link to your blog in your comment so I can track you down if you win! Thanks for stopping by my blog. 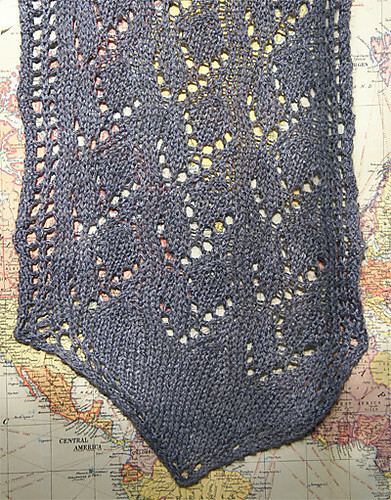 While your here, you might want to sign up for my Mystery Shawl KAL starting next Friday. Details here. Note: Pattern pictures courtesy of Classic Elite Yarns.